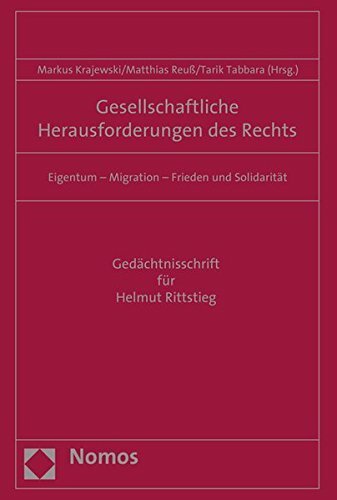 This volume honours Helmut Rittstieg (1939-2002), who was Professor of Public Law at the University of Hamburg from 1976 to 2002. The essays remember a scholar who was an "advocate for minorities, a pioneer for the thougtful and a comrade of the brave" ("Den Minderheiten ein Fursprecher, den Nachdenklichen ein Vordenker, den Mutigen ein Mitstreiter," Gerhard Strate). The contributions adress subjects to which Helmut Rittstieg contributed from an academic and a poltical perspective. These include migration, refugee and nationality law which were shaped by Rittstiegs work. In addition, issues of property law, European, international and transnational economic law are discussed. The volume also contains presonal memories of Helmut Rittstieg.